October 3, 2012 - GE Capital Aviation Services (GECAS), the commercial aircraft leasing and financing arm of General Electric and Boeing finalized a firm order for 85 737s, which includes 75 737 MAX 8s and 10 Next-Generation 737-800s. 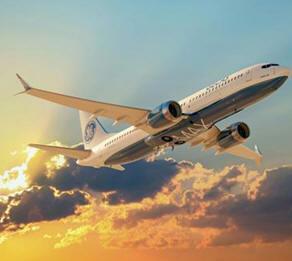 The order, first announced as a commitment at the Farnborough Airshow in July, allows for up to 15 additional 737-800s. The order, worth $6 billion at list prices, further illustrates both the strength of the 737 MAX and the continuing strong demand for the Next-Generation 737 in the airplane-leasing industry. To date, 821 737 MAX airplanes have been ordered. “The 737 MAX will be a perfect complement to our broad portfolio of modern, fuel efficient aircraft that offer our airline customers the lowest operating costs,” said GECAS President and CEO Norman C.T. Liu. "GECAS is a leader in the commercial airplane leasing industry with a successful track record of placing 737s with airlines worldwide,” said President and CEO Ray Conner, Boeing Commercial Airplanes. The 737 MAX is a new-engine variant of the world's best-selling airplane and builds on the strengths of today's Next-Generation 737. The 737 MAX incorporates the latest-technology CFM International LEAP-1B engines to deliver the highest efficiency, reliability and passenger comfort in the single-aisle market. Airlines operating the 737 MAX will see an 8 percent operating cost per seat advantage over tomorrow's competition. With this order, GECAS has ordered 580 airplanes directly from Boeing since 1995, which includes 737s, 747s, 757s, 767s and 777s. To date, GECAS has taken delivery of 433 of the airplanes.